You know how glitter sticks to everything... Just when you think it’s all cleaned up, your husband calls from work to tell you one of his co-workers spotted a piece glittering on him! It’s Christmas time! Time for some glitter! As I was praying this morning, I pictured hope like gold dust sprinkled all over me (a powdering of God’s glory). As I prayed for the children, I pictured Jesus sprinkling that gold dust over each one of them. What if hope were like that in our lives? Like glitter that sticks to everything! That everything we touch would begin to glitter with the hope of Jesus. Wouldn’t that be amazing? The sun was setting fast on our first day at the Grace Center in 2007. We would soon be plunged into the deep darkness of a tropical night. I surveyed our camp, three small tents inside a grass fence. Around the perimeter of the fence I could see ashes and soot where the fence had been burned to the ground the night before by a group of people who did not want us in their community. Mr. Mbota and a few men spent the day before we arrived rebuilding it. “Mr. Mbota, do we have any pots to cook our supper?” I asked. He grinned and said, “I’ll be right back.” He ran to a nearby village and found a pot. “Mr. Mbota, do we have any firewood?” He grinned again, “I’ll be right back.” He ran to the same village and found some firewood. “Mr. Mbota, do we have a knife to cut up the chicken?” His smile grew even bigger. “I’ll be right back,” he said. He ran to the village once again and found a knife. No matter how large the problem or how many times I came to him, Mr. Mbota was still overflowing with confident hope. That day as we set up our camp on the barren ground, Mr. Mbota sprinkled hope all over me. I could easily have become discouraged, but he allowed his hope in Jesus, in the vision we had for that barren ground, to overflow onto me. Where there was once darkness, a great light is shining in Malawi. The hope that is overflowing through people like Ben Mbota is sprinkling onto the children and the people of the Grace Center community. A man who was once called a fool for his service at the Grace Center is one of the most respected men in the community, and is one of God’s greatest vessels for sprinkling hope onto the people of the community. Mr. Mbota, the fingerprints of grace that you are leaving on the children and the community surrounding the Grace Center, glitter with hope. May Jesus continue to pour out his grace and hope through you. This Christmas season, consider where you might be able to sprinkle some glitter onto the lives of those around you. 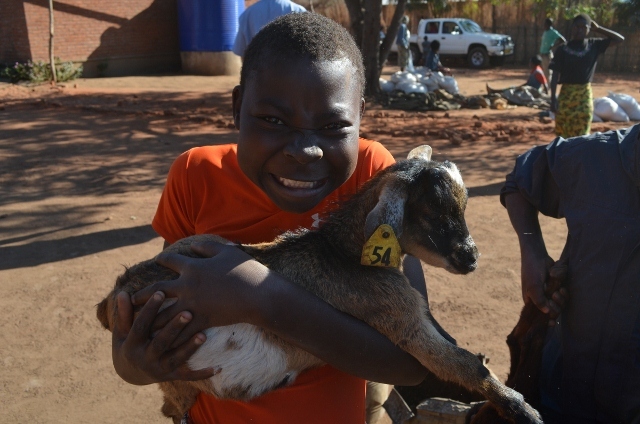 One exciting way is through giving a Christmas gift to a child in Malawi! There are 3 options this year, helping buy playground equipment ($5), chickens for your child’s family ($15), a goat for your child’s family ($60). Visit the COH Store to purchase these items or include them in your sponsorship payment. I pray that like Mr. Mbota, you too will be overflowing with confident hope this Christmas! Posted on December 3, 2012 by Karen Roller.